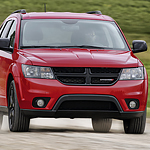 The frigid winter cold is no match for the new Dodge Journey. In addition to having a robust climate control system, this popular mid-sized SUV has unique features available for the front seats. With a press of a button, you and your front passenger can enjoy a soothing warmth you'll never want to leave behind. Take a seat inside the Journey at Bayside Chrysler Dodge Jeep to experience the optional heated seats. Heating elements are sewn right into the back and bottom of the seats. Simple controls on the center dash turn this feature on or off. Once initiated, the heating coils will produce a soothing warmth that radiates through the fabric and into your body. The built-in heating isn't just reserved for the seats. You can also get a heated steering wheel. This feature is designed to keep your finger toasty and nimble, allowing you to drive confidently. The heating system is cleverly hidden beneath the plush leather trim.